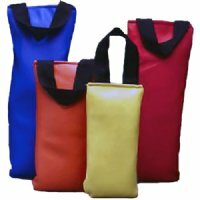 Colored outer bag is nylon reinforced vinyl, and dielectrically sealed to prevent leakage or dust. Inner bag is electrically sealed for added protection. Covers are nylon reinforced, color coded vinyl, labeled with weight. Complete with convenient handle. 15 1/2" x 6 1/2"